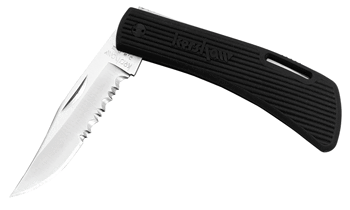 Kershar Knife DWO III 3003 serrated edge folding pocket knife. Blade locks safely into position and releases easily. Blade is 2 3/4", made from AUS-6A stainless steel. Handle is 4". DWO knives are dedicated to the memory of Delley Wade Officer who died in a tragic hunting accident.